Now that her husband, former Arkansas Gov. 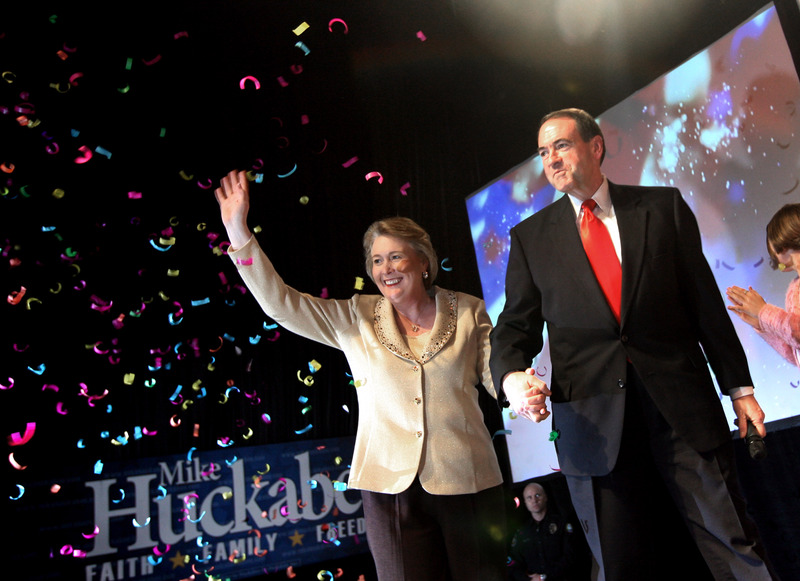 Mike Huckabee, has announced he'll seek the GOP nomination for president, it's worth getting to know more about Janet Huckabee, his wife of 41 years. They're sort of a fascinating couple, deeply religious, and well familiar with the political spotlight, beginning with Huckabee's first election as Arkansas lieutenant governor in 1993, up to and including his unsuccessful campaign for the Republican presidential nomination in 2008. Janet has run for office herself, seeking election as Arkansas secretary of state in 2002, the same year her husband was seeking reelection as the state's governor. She ran a tough race, and even told The New York Times at one point, when she was under criticism for using state vehicles during the campaign, "If it wasn't for the grace of God, I'd have shot a few people already." Voters were apparently not comfortable with electing a husband-and-wife team to two of the state's top offices (as secretary of state, she would have been responsible for counting votes in a governor's election), and she was defeated. The former Janet McCain (no relation to Arizona Sen. John McCain, who ultimately beat her husband in the 2008 GOP primary), was born in Lake Charles, Louisiana, and moved with her family to Hope, Arkansas, as a baby, the fourth of five kids. The couple married in 1974, after a first date that consisted of cheeseburgers at a truck stop, according to ABC News. "It was a real treat for me. The treat was the milkshake," Janet said of their first date. Two years after they were married, Janet was diagnosed with spinal cancer, according to a 2007 Newsweek article, and faced the possibility not only of paralysis, but of not being able to have children. She told Newsweek that her husband remained devoted to her throughout her treatment. It was a testing of his commitment to me. He took care of me, helped me learn to walk again, took me daily for six weeks to radiation therapy. She told ABC News that despite her husband's prowess as a musician, early in their marriage he sold off some of his beloved guitars to buy a washer and dryer. "This was a big deal for me," Janet said. A 2008 Slate article on the Huckabees' marriage — which the couple calls a "covenant marriage" — refers to Janet's work with Habitat for Humanity and her work helping evacuees of Hurricane Katrina in 2005, getting aboard a bus to help hurricane victims with paperwork rather than having them stand in long lines. That same Slate profile says Huckabee's decision to keep Janet largely in the background during his 2008 campaign was a mistake, because she has such potential to be relatable for the voters Huckabee wants to attract. She hunts, she skydives for fun, and she has a no-nonsense demeanor. So it will be interesting to see if Janet plays a larger role in the 2016 campaign.